I cannot recall a time when words did not matter to me. I remember being a child and my parents reading out of a short story book, and hearing the exploits of the man on the moon, eating cheese. I remember the illustration, and the poetic nature of the words my parents recited. I don’t recall the specific events that led to the first time I ever wrote creatively, but my mother does. She often re-tells the story to me, and when I feel most lost, I recount that story and what it helped me to produce as an affirmation of something pure and honest that dwells inside of me. It was 1995, and I was in 2nd grade. I remember my teacher, Mrs. Honig, who was a burly, tall, and thick woman (comparatively giant to my miniaturized frame). She was firm, and of course (to a child) that meant she was mean. I remember only flashes of the time I spent in her classroom. I remember having a neatly organized row of colored bears – rewards for correct answers – swiped off of my desk when I was discovered having my first day dream. I would have many more before I learned to channel my imagination. I remember her hair, short, curled slightly, and a stark black contrast to the red makeup splattered along her slightly tanned and chubby cheeks. But it was she who gave my mom and I the first encouraging words, and who took notice to my writing. That particular story begins that, at 7 years old, I was given a writing prompt. The assignment was to was to write a story about something we owned. I distinctively recall being in a panic. I remember thinking that there were no objects or people in the world, and that I would never come up with a subject upon which to write. I was alone and singular. 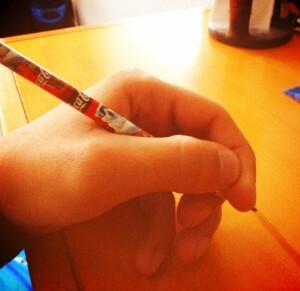 And then, I looked into my left hand, and saw my pencil. And thus, I began, simply trying to tell some story about the only object that I could imagine existed in all the world. And I wrote. I wrote about the pencil, which was born at a factory, and put into a box with many of its pencil friends. And I described the dark time when the box was kept closed and the pencil didn’t know where it was. I imagined its excitement upon being opened, and the sadness when it was taken away from its friends. I recalled its eager enthusiasm at being purchased by my mother. I considered that it might have wanted to get to know me, and that it tried to tell me when I was writing an answer down incorrectly on an exam. I recalled the fear it had the first time it was sharpened, and its realization that one day there would be nothing left of it. I remember saying that the pencil was thankful that its story was told. Afterwards, my mother told me I had written several paragraphs in the small amount of time we were given. She had also said that I had written the best story in my class, according to the formidable Mrs. Honig. That made me proud. And 16 years later, I remember that story, because for all of its faults (grammatical, spelling, narrative inconsistencies, and the lot) it was compelling. I used literary tools like personification and demonstrated some part of myself that hasn’t ever been bound by limitations. Whenever I feel stuck, or unsure of my choices as a writer, I remember that story – from which all of my other stories have been born. It is the eldest, and purest example of what I have inside of me. And that story is where the incubation of my articulation began. It was my first expeirence as a writer, and in that moment, it dawned on me that I enjoyed writing because others enjoyed it. It was a sort of therapy: If I could write stories, I could share myself and explore the ideas I had with other people (which was not something the quiet kid in class had ever considered possible). And for those of you who wonder, I keep that pencil- a coca-cola pencil, (and its mates) safe and mostly whole in my room to this day. It is my oldest friend.